Pet Urine and Odor Problems? 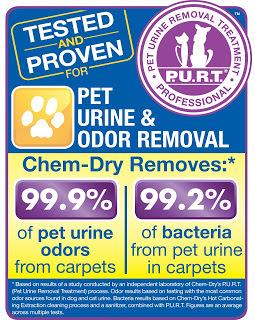 This is what happens if you don't have your Pet Urine Deposits treated by a Chem-Dry Professional. Over time, the urine will show up as a brown stain, and eventually, it will completely and permanently bleach your carpet. If the stain is still brown, we can treat and eliminate the Urine, including the bacteria and the odor. 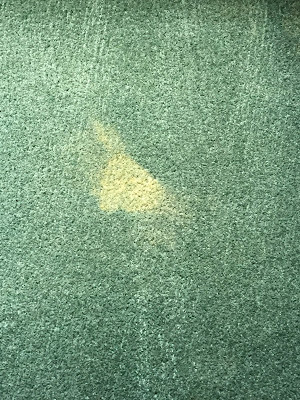 However, if it has bleached the carpet, these bleach spots can not be removed or repaired without a carpet patch or an attempt to color match and dye the carpet. Both options can be expensive! A small deposit, the size of a softball, on the surface of the carpet is actually a sign of much more serious problems below. Pet urine sinks all the way to the sub-floor, and a softball size deposit above can lead to a basketball size pool of Urine on the sub-floor. 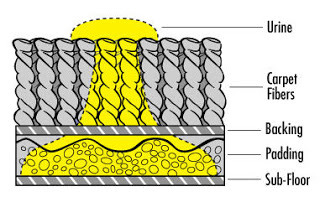 Urine deposits are acidic and crystallize over time, releasing urine odors for up to five years. Carpet professionals and Insurance companies consider Pet Urine to be permanent damage to your carpet and usually void any warranty or future claims. We all love our pets, but it is critical to our healthy home and our quality of life that urine deposits are treated as soon as possible. 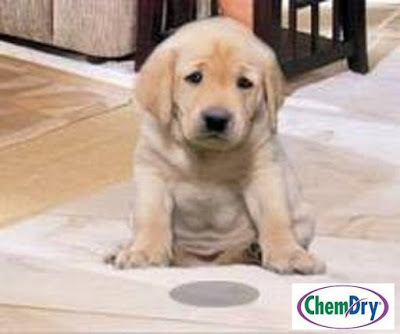 ChemDry has developed a proprietary product that will eliminate Pet Urine Odors and Bacteria as if it never happened. Our Pet Urine Removal Treatment is truly amazing! Our customers love it, and give us wonderful reviews based on our unique ability to eliminate Pet Deposits. Love your family! Love your Pets! Make it a priority to address the stinky urine accidents! Visit our website at www.mychemdry.com or Call us Today! 817-558-3113. We are a Locally owned and operated small business in Johnson County, Tx for 25 Years. We provide Green Certified, Kid Safe, Pet Safe Carpet Cleaning that Dries in 1-2 hours! We also Clean and Seal Tile, Stone and Grout. We clean upholstery, mattresses and area rugs, as well as provide Granite Countertop Renewal. And if you experience a flood or water damage, we provide water damage restoration services in Johnson County too! We have an A+ Rating with the Better Business Bureau, a 5 Star Rating on Google, and All 5 Star Reviews on Facebook. Call Today! 817-558-3113. And a quick shout out to ChemDry of San Angelo! If you are in the San Angelo, Tx area, give Bill a shout! Here is a list of other friends that may be able to help in your area. Also visit the Cleburne Chamber of Commerce and the Joshua Area Chamber.